Students at hundreds of US schools walked out of class last Friday, joining thousands around the world to demand action against climate change. Despite the Trump administration’s destructive policies, at least one public institution seems to be getting it right: New York City public schools. 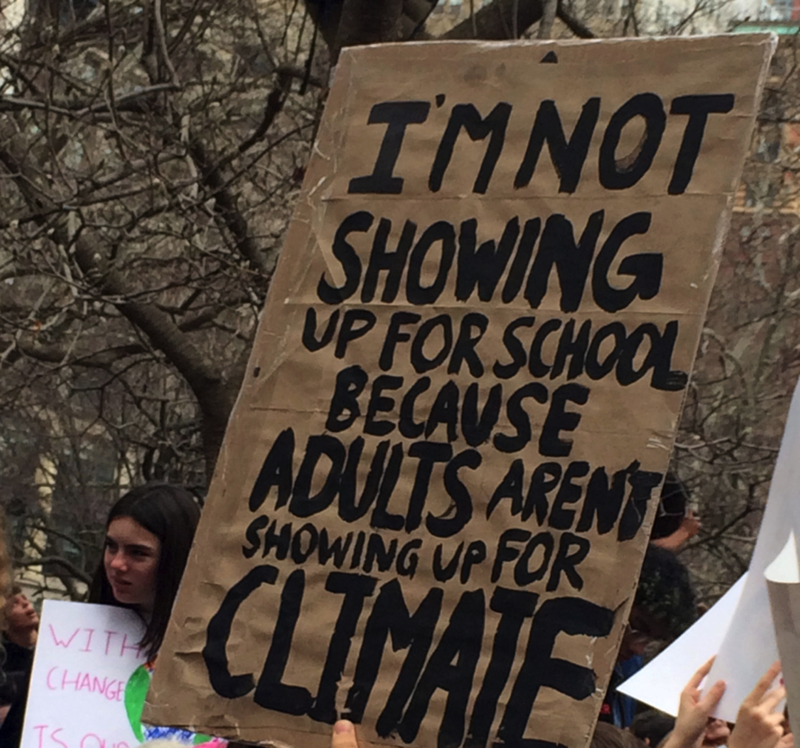 A sign at the March 15 climate school strike in Lower Manhattan. Liza Featherstone / Jacobin. Students in New York City joined others around the world in a coordinated school strike Friday, walking out of class to demand action on climate change. There were more than four hundred such strike actions in the United States alone and at least 1,600 worldwide, in more than one hundred countries. Although the New York City government — not to mention the national government — could be doing much more to address the problem, it is getting one thing right: some of our public schools are nourishing the engaged and informed citizenry that this crisis needs. Alaisha Negron and Shemiah Neckles, both 16, at the March 15 climate strike in Lower Manhattan. Liza Featherstone / Jacobin. Negron, along with Shemiah Neckles and Sanaa Wells, both 16, are students at the Urban Assembly Institute of Math and Science for Young Women. “Climate change is a big thing at our school,” adds Shemiah Neckles, explaining that they grow aquatic plants, including lettuce and cucumber, and use no bottled water. She walked out of class again Friday, this time with solidarity from all over the world. The US Youth Climate strikers were demanding a Green New Deal; an immediate halt to all fossil fuel infrastructure projects, including pipelines; preservation of public lands; a requirement that all policy decisions be grounded in scientific research; and that climate change be declared a national emergency — and compulsory K-12 education on climate change. In front of City Hall, there were thousands of kids, as well as some parents and teachers. One sign, marked “12 Years Left,” referred to the 2018 report by the United Nations Intergovernmental Panel on Climate Change (IPCC), which warned of irreversible consequences unless decisive action is taken to ease global warming within twelve years. 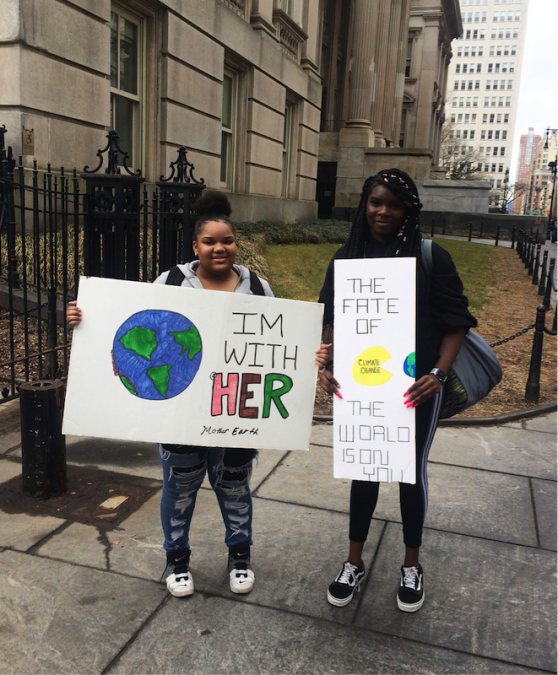 Chinyere Meremetoh, eighteen, a student at the High School for Environmental Studies in Midtown, held a sign recognizing Greta Thunberg, the sixteen-year-old Swedish girl who has become a worldwide leader in the climate movement. Thunberg’s activism started with a weekly solo Friday school strike, and she has inspired kids in Sweden and around the world to do the same. 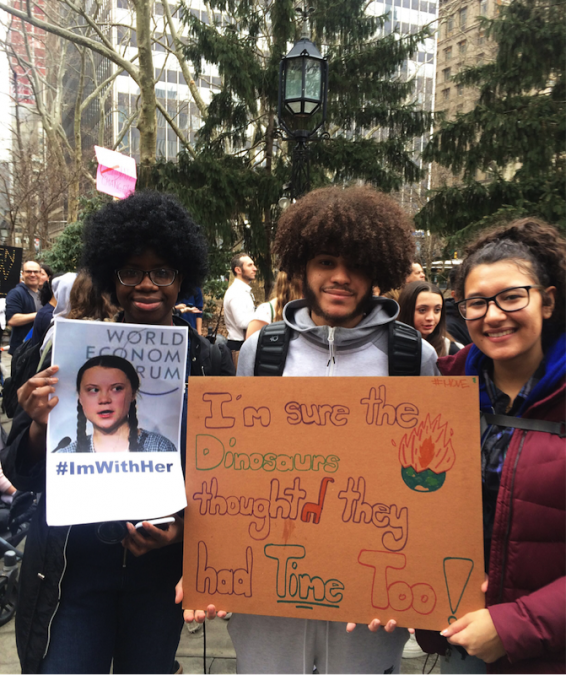 Chinyere Meremetoh, Emmanuel Pimentel, and Melanie Mueses, students at the High School for Environmental Studies in Manhattan. Liza Featherstone / Jacobin.